Changing one’s mind can also invite attention for all the wrong reasons. Those who used to agree with you may call you a flip-flopper or question your sincerity: did he really change his mind or is he just hoping for some advantage? Those who agree with you now may want to use you as a poster child for their cause. So-called “Wrongologist” Kathryn Schultz has spent several years exploring the experience of being wrong. She observes that we live in a bubble in which we assume we are always right. Being wrong feels exactly like being right, she says. It is only when we realize we’re wrong that our wrongness elicits feelings of dread or embarrassment. Schultz goes on to propose ways to help people step outside our comfort zones and change their minds and hearts. After meeting the risen Christ on the road to Damascus, Paul experienced a profound change of heart that pointed his entire life in a new and unexpected direction. Once a fierce persecutor of the church, now Paul was commissioned to proclaim the message of Jesus to the world. Kathryn Schultz, “On Being Wrong,” TED.com http://www.ted.com/talks/kathryn_schulz_on_being_wrong?language=en. Michael Pearson, “I Meant That Then, I Mean This Now: Famous Changes of Heart,” CNN.com, 15 March 2015 http://www.cnn.com/2013/03/15/us/famous-changes-of-heart/. • When have you changed your mind on an important topic? How did people respond to this change? • How can we know if a person’s change of heart is authentic or calculated? Two distinctive elements are especially emphasized in these biblical accounts of Paul’s ‘Damascus Road’ experience. First, this experience was a divine revelation, God making known something otherwise unknown. Acts describes it as a ‘heavenly vision’ (Acts 26.19); Paul himself describes it as a ‘revelation of Jesus Christ’ to him (Gal. 1.12, 16). Second, this experience was a conversion of some sort, though precisely what kind of conversion remains a matter of some dispute among scholars. Clearly it resulted in a radical change in thinking and behavior for Paul, and it certainly brought about a drastic change in Paul’s social and even religious situation. 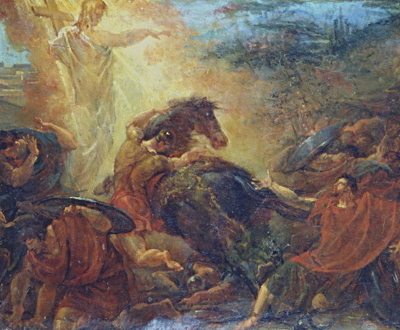 However, the biblical accounts do not describe this experience as a change in religion for Paul, or a change from irreligion to religion or from immorality to morality, but more as a call by the same God to serve him in the right way reflecting the changed situation brought about by the resurrection of the crucified Jesus. Drawing on these two primary elements from the biblical texts, ‘Damascus Road’ has come to symbolize any sudden and radical change in thinking and behavior resulting from a single, intense experience. Certainly this is the case in religious contexts as the image frequently symbolizes conversion to Christianity from another religion or worldview. The history of Christianity is thus filled with references and allusions to Paul’s ‘Damascus Road’ experience. In literature and art, the story represents an idealized conversion, and the phrase ‘Damascus Road’ or similar expressions can be found today in everything from church names to song lyrics. But the phrase is not limited to religious contexts in Western culture. For example, someone who ardently opposes a particular political candidate but suddenly becomes a fervent supporter of that candidate after hearing her speak could be said to have had a ‘Damascus Road’ experience. Michael W. Pahl, “Damascus Road,” Dictionary of the Bible and Western Culture, ed. Mary Ann Beavis and Michael J. Gilmour (Sheffield UK: Sheffield Phoenix, 2012), 103–104. Verses 3-9 describe Saul’s encounter with the risen Lord. As Saul approaches Damascus, a flash of light from heaven interrupts the action (v. 3). Readers familiar with biblical imagery would suspect that Saul is about to experience a divine manifestation, or theophany. Biblical narrative regularly employed light (Isa 2:5; 60:19) and flashes of light (Exod 19:16; Ezek 1:4, 13) to denote the presence of the divine. Saul falls to the ground, either out of reverence or fear, and readers and he together hear a voice (v. 4). Readers know that either God or Jesus speaks. Saul, however, is baffled—in the dark, so to speak, as his question makes clear: “Who are you, Lord?” (v. 5a). Readers hear the question ironically, for Saul is addressing “the Lord” whose own disciples he is threatening to kill (cf. v. 1). Saul’s confusion is quickly clarified as the Lord Jesus identifies himself as the one whom Saul persecutes (v. 5b). Readers learn something also about how close the relationship is between Jesus and his followers: “Whoever persecutes Christians persecutes Christ” (cf. John 13:20). In obedience to the command “to arise” (v. 6), Saul gets up. He now discovers on a literal level what readers already knew to be true about him on a spiritual/metaphorical level: he is blind (v. 8). Ironically, through this physical blindness he will come to see spiritually what he had not to this point been able see: that Jesus is the Messiah in whom God’s promises to Israel find fulfillment. His companions lead him to Damascus. He waits in darkness for three days, neither eating nor drinking. The text offers no reason for this fast, but later clues (e.g., “praying” [v. 11b], visionary experiences [v. 12], and eventual baptism [v. 18]) imply penance. The scene switches to an unspecified locale in Damascus and a new character, Ananias (v. 10). The narrative does not distract the reader from the main action by offering any information about him. Ananias’s vision contrasts with that of Saul. Key, of course, is that Saul must respond to the voice he hears with a question (see v. 5), while Ananias, as a disciple, responds in a manner reminiscent of great persons of faith from the biblical story: “Here I am, Lord” (cf. Gen 22:1, 11; 1 Sam 3:4-14; Isa 6:8). The vision (vv. 11-12) indicates divine direction, something with which readers are growing quite accustomed. Note the specificity: the name of the street (Straight), the specific home (Judas’s), the name of the one Ananias is to help, and even some details about Saul. By listening in on Ananias’s vision, readers learn that Saul is in prayer, pointing to his sincerity. Further, readers learn that, even as Ananias is having a vision about Saul, Saul is having a vision about Ananias. This informs readers that God is very much involved in the action. Further, Saul’s vision that he will regain his sight through Ananias assures readers that the Lord will show mercy to Saul. God is answering Stephen’s prayer (7:60), as well as Saul’s. J. Bradley Chance, Acts, Smyth & Helwys Bible Commentary (Macon GA: Smyth & Helwys, 2007), 146–49.